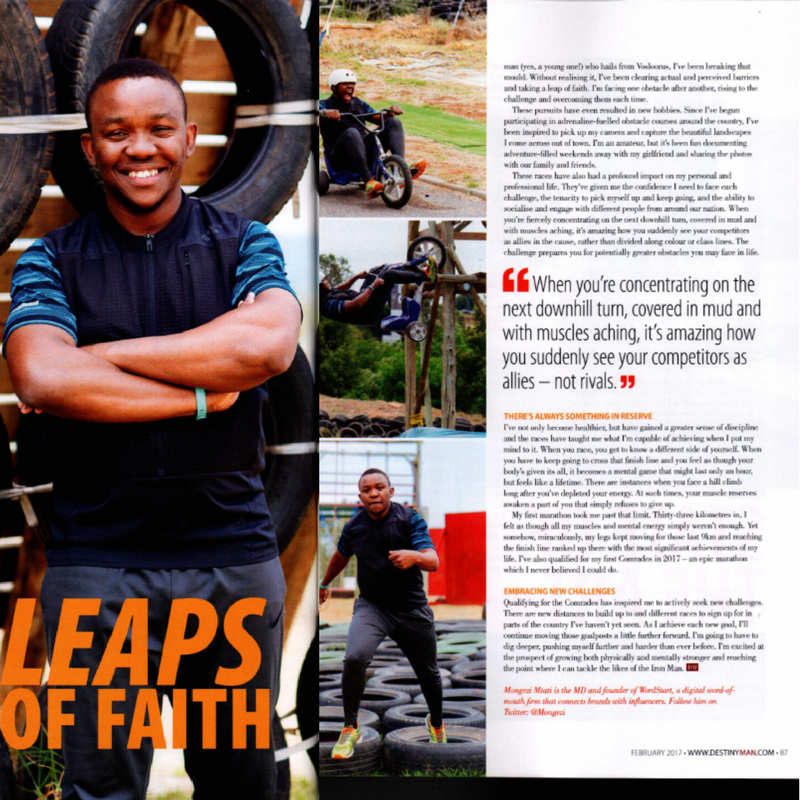 A little over two and a half years ago I took on the challenge of changing my lifestyle, of getting healthier, fitter and more active – I had no idea that the journey would end up on Destiny Man. The February 2017 issue of the prestigious men’s magazine, in stores now, features some of the things I discovered along the way. At the time of starting with my very short run – which felt like I had just done the Ironman – I had no idea that the path would lead to being more effective at work, to making new connections with people who would have never been on my radar under normal circumstances. As it happens when you start on a new journey to change your life, there are always obstacles and rude awakenings. In my case, ice-cold damper in my deep slumber was a running app that was recommended by Phetheho Mosia whom I’m sure got a thrill from mild disappointment. The article talks to how I discovered that shortness of my Ironman run and walk, but it’s great that the awakening occurred when it did. You’ll also discover how important it is to have key goals for your new lifestyle and somebody to crack the whip and in my case it’s the obstacle racing Peter Peele. He manages to push long past I’ve exhaled my last breath and only fire goes through my chest. So yes, I’m surrounded by legends who push me. I wouldn’t call them friends when huff, puff, limp, curse the day I met them and imagine the finish line. Lindsay Grubb cracks the whip when I slack with the writing which has proven to be invaluable and boy is that absolutely helpful. Documenting some of these stories needs magician’s eye and she just may be the unmentioned secret inspector at the literature department at Hogwarts. Thanks to Marco Caromba, Duncan and the Jozi X team for allowing us to use the park for the pictures and the adventure experience that you’ll see in the piece. They host some of the most challenging obstacle course races that will make you want to get fitter and they are also the friendliest bunch you’ll ever meet at these activities. Their BattleRush events introduced us to the adrenaline and the bug of obstacle course racing. Check them out here. This past weekend marked the fastest – relatively uphill – half marathon (21.1km for the non runners) that I have taken on. Please get a copy and share your thoughts.